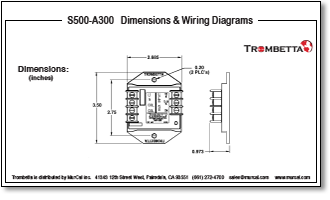 Trombetta’s S500-A300 electronic control is built for single-winding solenoid applications, and gives you the option of using AC or DC voltage for the Aux trigger signal. 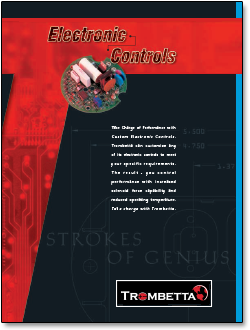 This module accepts your 2-wire switched input (90-130VAC or 12-24VDC) and applies full voltage to the solenoid coil. 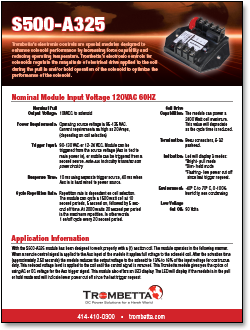 Nominal pull output voltage is 108 VDC to the solenoid. After the actuation time the module reduces the output voltage to the solenoid to 13% - 16% of the input voltage for continuous duty. 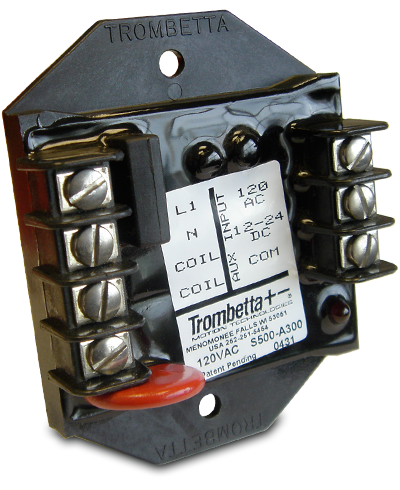 This reduced voltage level is applied to the coil until the power is removed. The A300 module will adjust its duty cycle depending on the line voltage, and offers an LED display. The LED will display bright if the module is in the pull mode, dim when the module is in the hold mode, and will flash to indicate low power cut off since the last trigger request. This model has a response time of 10 ms using a separate trigger source, and 40 ms when Aux-in is hard wired to the power source. 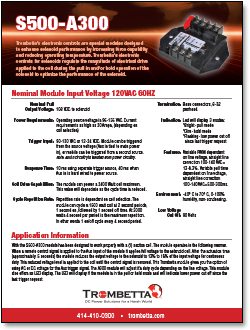 The module can power a 2400 Watt coil maximum, and features variable pulse width modulation (PWM) dependent upon line voltage. Termination is beau connectors, 6-32 panhead. 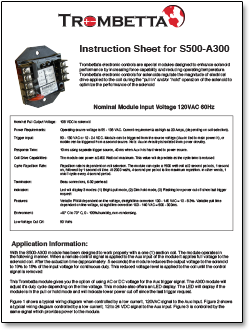 The S500-A300 module has been designed to work properly with a (1) section coil. The module operates in the following manner. When a remote control signal is applied to the Aux input of the module it applies full voltage to the solenoid coil. After the actuation time (approximately 0.5 seconds) the module reduces the output voltage to the solenoid to 13% to 16% of the input voltage for continuous duty. 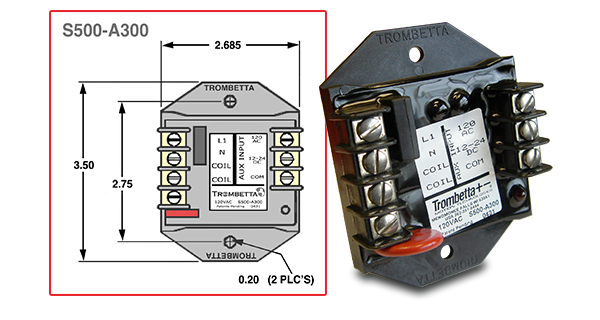 This reduced voltage level is applied to the coil until the control signal is removed. This module gives you the option of using AC or DC voltage for the Aux trigger signal, and will adjust it’s duty cycle depending on the line voltage. It also offers an LED display. The LED will display if the module is in the pull or hold mode and will indicate lower power cut off since the last trigger request. Click here to purchase the S500-A300 in the MurCal web store.